GLUCOSE - a simple sugar produced via photosynthesis and used as a source of energy. Alcohol fermentations often occur over months, so added sugar is required as a food source for the alcohol-producing yeasts to survive. 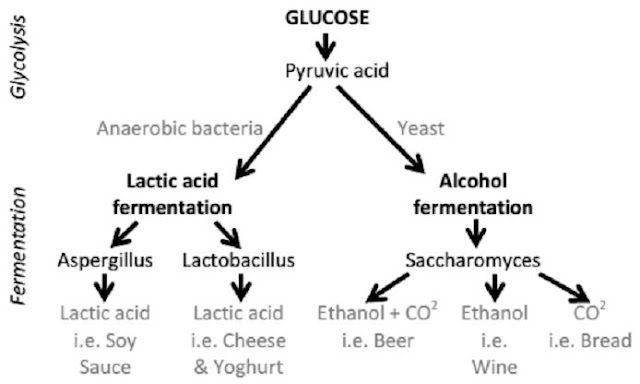 PYRUVIC ACID – ferments to produce alcohol during anaerobic fermentation. YEASTS – one of the first domesticated microorganisms, saccharomyces are one type of yeast that convert carbohydrates into alcohol and carbon dioxide. Wines can be made using wild yeasts (natural microorganisms found on the ingredients used) BUT more consistent results are achieved by adding brewing yeasts – they can be beer yeast, wine yeast, etc. The type of yeast used will determine the flavour, and the sugar quantity will determine whether a brew is sweet, dry etc. Champagne/wine yeast is the most versatile – and can be used for many types of alcohol fermentations. ETHANOL – alcohol is produced when the yeasts ferment the sugar.